Looks great! That was a 70% hydro? Mike, this was 69% hydration. Honestly, this pie looked better than it tasted. 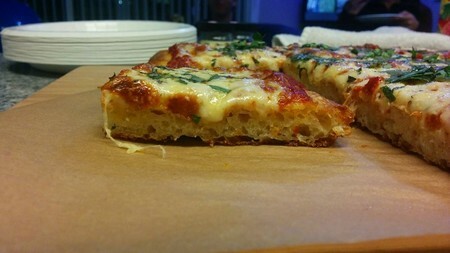 The dough was phenomenal, but it wasn't properly topped. Mediocre sauce and not enough cheese. Will post my latest tomorrow. Looking really good. What oven are you cooking in? Home? Temp? Stone or steel. Are you using a allied pan? Thanks Tony and Mike. This was a 12x12 Allied metal pan baked in my Bakers pride countertop. ~450-500. So, this pie looked pretty nice, but was mediocre at best. For the last ten years I've been making thinner pies, so I topped this without taking into account the added dough weight. 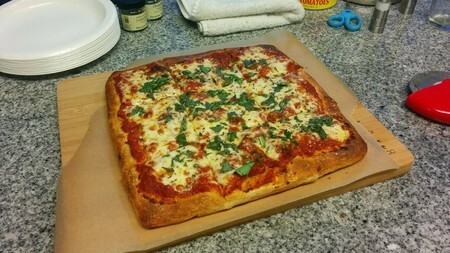 Tonight I made another Sicilian, along with 8 other pies. The Sicilian was considered one of the top two pies of the evening. Used a combination of Buffalo mozz and whole milk. Yowza. I'll post pics tomorrow.